Vehicle roadside assistance is a service that assists the driver of a vehicle in case of a breakdown. Vehicle roadside assistance offers on-site assistance to vehicle owners and drivers with basic support, which includes on-site minor electrical and mechanical repair, flat tire support, battery jump start, misplaced or lost keys (lockout service), towing of the vehicle, and fuel delivery service. Vehicle roadside assistance is an effort by auto service professionals to sort minor mechanical and electrical repairs and adjustments in an attempt to make a vehicle drivable again. The global vehicle roadside assistance market is primarily driven by an increase in the number of aging vehicles, which are more likely to witness breakdown and several mechanical & electric issues, which in turn demands vehicle roadside assistance services. Moreover, surge in installation of app-based services has led to a reduction in response time for vehicle roadside assistance services, which in turn is propelling the global vehicle roadside assistance services market. Extreme weather affects millions of drivers across the globe, especially cold weather where frigid air causes electrochemical reactions in batteries of vehicles, which in turn drains battery power and leads to battery jumpstarts. Furthermore, icy and snowy terrain across several countries leads to treacherous driving conditions and is likely to increase the risk of fatal road accidents, which in turn demands vehicle roadside assistance services. Surge in vehicle sales and registrations across the globe has also led to an increase in road fatalities and vehicle breakdowns. Reduction in vehicle loan interest rates, easy availability of finance with customized financial schemes, and increase in per capita income of consumers are key factors driving vehicle sales and production. This, in turn, is anticipated to boost the global vehicle roadside assistance market during the forecast period. Higher cost of vehicle roadside assistance service during the pay per use service is a key factor restraining the global vehicle roadside assistance market. This is primarily due to labor and service charge rates, which are included in membership plans; however, they are charged in pay per use service. All services are offered by the service provider in terms of membership plan, which are considerably cost-effective, as it remains valid for one year and above; however, different vehicle roadside assistance service providers have different terms and conditions. In terms of service, the towing service segment accounted for a major share of the global vehicle roadside assistance service market, in terms of revenue, generated in fiscal year 2018. Towing due to collision or breakdown comprises the most basic request for emergency road assistance. Therefore, the towing segment held a major share of the market. Demand for vehicle roadside assistance due to tire replacement arising due to tire burst, puncture, & loss of inflation, jump start/pull start, battery assistance, and lockdown/key replacement services was also notably high. In terms of provider, the global vehicle roadside assistance market was dominated by the auto manufacturer segment, which is primarily attributed to an increase in preference of auto manufacturers to provide road assistance services as a part of warranty. Several vehicle manufacturers, such as Honda, are providing vehicle assistance services in several countries. Several other vehicle manufacturers such as General Motors, Hyundai, Toyota, Ford, and Mitsubishi are expected to provide roadside assistance services for vehicle owners and hence, the auto manufacturer segment is estimated to lead the global vehicle roadside assistance market during the forecast period. Passenger vehicle was a highly attractive segment and held a prominent share of the vehicle roadside assistance market across the globe in 2018. Passenger vehicles are primarily covered under the auto manufacturers’ free warranty and hence, accounted for a notable share. The passenger vehicle segment is followed by the light commercial vehicle sub-segment. Moreover, truckers are purchasing roadside assistance in order to avoid operational losses, thus propelling the heavy commercial vehicle segment of the market. Large number of on-road vehicles coupled with increase in sales across Europe has led to increase in number of vehicle breakdowns, which in turn drives the demand for vehicle roadside assistance services. Presence of premium vehicle manufacturers and availability of roadside assistance service providers are propelling the vehicle roadside assistance market in Europe. 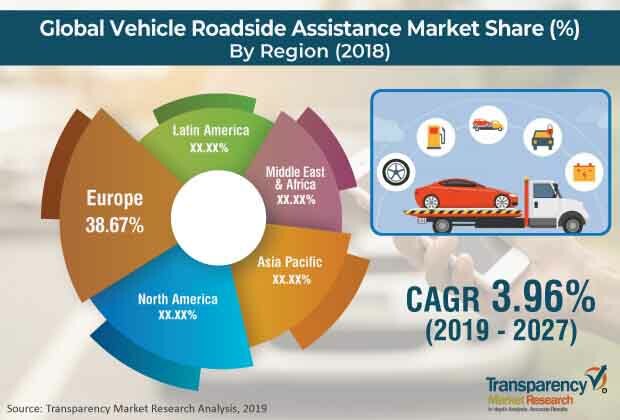 Raised per capita income, higher standard of living, consumer preference for lavishness, and increase in sales of premium vehicles are fueling the vehicle roadside assistance market in Europe. Demand for roadside assistance services is high in North America, which is primarily attributed to unfavorable weather across several areas, increasing number of aging vehicles, and preference for roadside assistance services by auto manufacturers. Moreover, the vehicle roadside assistance market in Asia Pacific is estimated to expand at a rapid pace during the forecast period owing to the increasing demand for vehicles across the region coupled with increase in per capita income and availability of roadside assistance service providers. Key players operating in the global vehicle roadside assistance market include ARC Europe SA, Viking Assistance Group AS, SOS International A/S, Swedish Auto, Falck A/S, Allianz Global Assistance, AAA, Agero, Inc., Allstate Insurance Company, AutoVantage, Best Roadside Service, Paragon Motor Club, Roadside Masters, Access Roadside Assistance, Good Sam Enterprise, LLC, Emergency Road Services Corporation, Better World Club, National General Insurance, Honk technologies, URGENT.LY INC., spanwings, TVS Auto Assist India Limited, Twenty Four OTR Pvt Ltd, RESCUE Vehicle Services Private Ltd., ASSURANT, INC., CHUBB LIMITED, Emirates Insurance Co. (PSC), Arabian Automobile Association, and Prime Assistance Inc. This report analyzes and forecasts the market for vehicle roadside assistance at the global and regional level. The market has been forecasted based on value (US$ Mn) from 2019 to 2027. The study includes drivers and restraints of the global vehicle roadside assistance market. It also covers the impact of these drivers and restraints on the demand for vehicle roadside assistance Service during the forecast period. The report also highlights opportunities and future scope in the market at the global and regional level. The report comprises a detailed value chain analysis, which provides a comprehensive view of the global vehicle roadside assistance market. The Porter’s Five Forces model for the market has also been included to help understand the competitive landscape in the market. The study encompasses market attractiveness analysis, wherein the service is benchmarked based on market size, growth rate, and general market share. The study provides a decisive view of the global vehicle roadside assistance market by segmenting it in terms of service, provider, vehicle, and region. These segments have been analyzed based on present and future trends. Regional segmentation includes the current and forecast demand for vehicle roadside assistance in North America, Europe, Asia Pacific, Latin America, and Middle East & Africa. The report also covers the demand for individual segments in all major countries across all the regions. The study includes profiles of major companies operating in the global vehicle roadside assistance market. Market players have been profiled in terms of attributes such as company overview, financial overview, business strategies, and recent developments. The global vehicle roadside assistance market is primarily driven by an increase in the demand for vehicles across the globe. Increase in number of vehicles has led to an increase in breakdown of vehicles, which in turn demands for roadside assistance Service across the globe. Moreover, aging vehicle fleets coupled with increase in per capita income are fueling the global vehicle roadside assistance market. The report provides the cumulative market size of vehicle roadside assistance for 2018 and forecast for the next nine years. The global market size has been provided in terms of value. Market numbers have been estimated based on service, provider, vehicle, and regional segments. Market size and forecast for each service, provider, and vehicle have been provided in terms of global and regional/country markets.